Summary: This is a higher end ‘club’ treadmill with all those little extras that home models miss out (incline is automatic, shock absorbing and so on). Sure the price point is above your average home treadmill, though you’d be surprised just how much you get for your money! Note: Big discount at amazon.co.uk at the time of writing, see the product page for the latest deal. Gym quality treadmill found in high end health clubs and well equipped home gyms. With a 3hp motor, flexi shock-absorbing running deck and 28 stone maximum user weight, this machine is gym specification and will provide the ultimate workout for years to come. This is a big model, and designed with running clubs / shared gyms in mind – though as long as you have the space this would be a worthy addition to anyone’s home gym. You’ll get a 3 horsepower motor, and a maximum user weight of 28 stone (which gives you a clue to how much sturdier it is compared to other home models). The Sprint 9 also includes shock absorbers, and has a top speed of a super-fast 20km / hour – more than enough for all but the fastest runners. What really sets the club-level machines and the rest apart is the automatic incline capability of the top models. 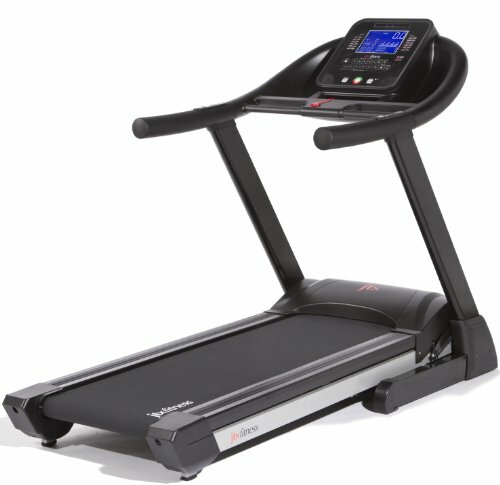 Cheaper (even many mid-priced) treadmills have manual incline, which means you have to stop, get off the running surface and pull some levers. With automatic incline this is computer controlled, which allows the incline to be integrated into the preset programs. You can run uphill (it makes a big difference) and then slow down for some recovery before you hit the next slope (for example). The console also sets the JTX Sprint 9 apart from the crowd, this is big enough to display all the info you need without needing to scroll through it. It is also Polar compatible (you get a free chest strap with your purchase), so you can make your workouts adapt to your heart-rate (or just monitor this). At the time of writing this review there is not a single 1 or 2 star rating given for this – and the only 3 star seems to have been by someone angry at the larger size of the treadmill (a bit of a rant, considering the dimensions are very clearly written in the description!). The quiet action of this machine came in for praise from multiple owners. In general those who bought the treadmill have loved it, including people who were overweight. Contrary to what the person that left the only 3-star rating suggest, the fact that this is a big and robust treadmill also came in for praise from several users. The JTX Sprint 9 Club Treadmill is designed with the kind of shared gyms in hotels and upmarket blocks of flats in mind. If you have extra space, and an eye for quality, then it can also be used for home gyms. This is a big and sturdy model, with auto-incline, shock absorbing surface and flexible (and Polar compatible) monitors. Add this high spec with the big amazon.co.uk discount (* at the time of writing!) and you have an amazing treadmill at a very competitive price. Check out the product page here to see that amazon discount for yourself!